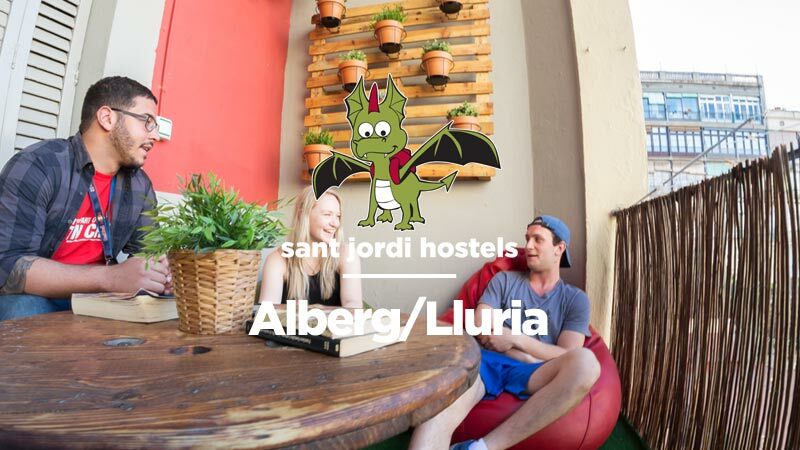 Follow the directions below and find your way to the Alberg/Luria hostel in Barcelona. The nearest metro stations are “Passeig de Gracia” (lines 2, 3, 4 and RENFE) and “Urquinaona” (lines 4). Each subway station is about 5 – 10 minutes walking from the hostel. We however, recommend coming with the metro line L3 (green) using the “Catalunya” stop (except when coming from ‘Barcelona Nord’). This is because the Passeig de Gracia metro stop has 4 different train lines connected by underground tunnels and is a huge subterranean maze. Coming from EL PRAT AIRPORT (BCN Airport): Take the Aerobus from the airport to Plaza Catalunya. When you get off the bus at Plaza Catalunya you will be in front of the Corte Ingles building (a very large department store, the size of the entire city block). Facing the Corte Ingles building, with your back to the street, go to your left. You will be going up the street Passeig de Gracia. Continue walking up on the right-hand side of Passeig de Gracia for 2 city blocks until you come to Gran via de les Corts Catalanes (a very large street with a Zara on one corner). Go right on Gran Via de les Corts Catalanes. Continue on Gran via de les Corts Catalanes for 2 blocks until you come to c/ Roger de Lluria. Turn left of c/ Roger de Lluria. The hostel is 30 meters up from the corner on the right hand side. Just in front of the door is a bus stop and directly across the street is a ‘Sorli Discau’ Supermarket. Coming from SANTS ESTACIO Train Station: Inside of the train station you will need to find the entrance to the metro. It is at the opposite end of the train station from the McDonalds. Take the metro line 3 (Green) in the direction of “Trinitat Nova” to the stop “Catalunya”. When you exit the train at the ‘Catalunya’ stop you will need to follow the signs that say sortida (exit) La Rambla. Once you have exited the metro and you are in front of Plaza Catalunya, look for the huge building that says ‘Corte Ingles’ on the top. It is a very large department store building and is the size of an entire city block. Standing directly in front of and facing the Corte Ingles building, with your back to the street, go to your left. You will be going up the street Passeig de Gracia. Continue up Passeig de Gracia 2 blocks until you come to Gran via de les Corts Catalanes (a very large street with a Zara on one corner and a Levi’s shop on the other). Go right on Gran Via de les Corts Catalanes. Continue on Gran via de les Corts Catalanes for 2 blocks until you come to c/ Roger de Lluria. Turn left of c/ Roger de Lluria. The hostel is 30 meters up from the corner on the right hand side. Just in front of the door is a bus stop and directly across the street is a ‘Sorli Discau’ Supermarket. Coming from GIRONA AIRPORT: Take the Barcelona Bus from the airport to Barcelona Nord Bus Station (final destination). Once at the Nord bus station follow the directions below for “Coming from Barcleona Nord”. Coming from BARCELONA NORD Bus station: Once at the Nord bus station you can either take a taxi to the hostel (not too expensive because it’s not so far from the hostel) or go with the metro. The metro stop is in the small park just next to the bus station and is named ‘Arc de Triomf’. The metro line at the ‘Arc de Triomf’ stop is the line 1 (red). Take the train that goes in the direction ‘Hospital de Bellvitge’ until the stop named ‘Urquinaona’. When you exit the train at the ‘Urquinaona’ stop you need to follow the signs that say sortida (exit) Pl d´ Urquinaona. This will bring you to one of the exits that come out in the plaza Urquinaona (a large park area with streets on every side). It is very important that you exit in the plaza Urquinaona. There are many exits for this metro stop and if you exit in the wrong place and you will get lost. Once in the plaza Urquinaona you need to find the street c/ Roger de Lluria. Look for the Irish Pub called ‘George Payne’. When facing the pub, with your back to the plaza, go to your right. The first street you come to will be c/ Roger de Lluria. Turn left on c/ Roger de Lluria. Continue up c/ Roger de Lluria for 2 ½ blocks. The hostel is on the right hand side. Just in front of the door is a bus stop and directly across the street is a ‘Sorli Discau’ Supermarket. Please be very careful about pick-pockets in Barcelona, they are very tricky. Keep your valuables safe (preferably in a money belt) and always have a hand on your bags. Be aware especially at the metro when you are arriving with all your belongings on you, and also at all the main tourist attractions.